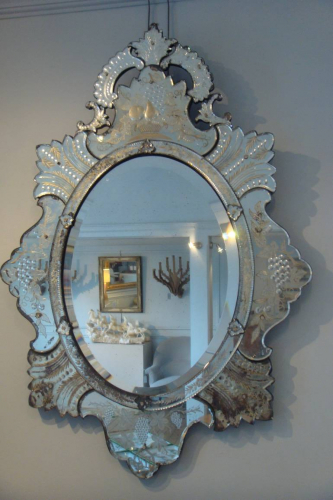 Antique Venetian oval mirror from the first half of the 19th century, decorated with etched floral and foliate design of grapes and apples and pears, secured with leaf shaped pieces held with little glass-topped screws. Beautifully decorated high cartouche in circlet and shell form and central, bevelled glass. Some silver losses in small places but in excellent original condition for it`s age.